“The world within reach” was one of the first slogans used to promote moving pictures at their commercial debut in the late nineteenth century. Starting with the Lumière Brothers’ traveling actualities and Georges Méliès’ interstellar expeditions on cardboard spaceships, cinema has since kept this promise beyond all expectations, transporting spectators across the universe for almost 120 years. Yet, to this very day, the space behind the camera remains more or less uncharted for filmgoers, an “authorized personnel only” area. There are two main reasons for this phenomenon. Firstly, a camera can only record what happens in front of its lenses, so most of the time, it is impossible to see the crew managing the film equipment : they are behind, not in front. Secondly, in the narrative cinema that constitutes the majority of the world’s film production, the crew and its labor must be invisible in order not to break the spectators’ willing suspension of disbelief. In fact, people can enjoy a fiction film only if they consciously mistake a fabricated world for the real one. They must believe against all logic that what they see on screen is happening at that very moment in front of their eyes, naturally and effortlessly, as if by magic. That is also one of the reasons why in cinemas the projector is located behind the audience’s backs, often in a separate, soundproofed room. Musical comedy Singin’ in the Rain (1952), one of the highlights of the “Glorious Technicolor” Berlinale retrospective, offers a perfect illustration of said “fictional pact” in the famous scene in which film star Don Lockwood (Gene Kelly) declares his love to chorus girl Kathy Selden (Debbie Reynolds) on a deserted Hollywood studio sound stage. By showing an actor staging and playing a love scene, the film is clear in declaring cinema a rhetorical construction : Don turns on a spotlight and a wind-machine, chooses a blue-sky painted backdrop, and so on. In spite of such a blatant “laying bare the device” approach, the film’s concealment of the laborers crowding the space behind the camera is ultimately no different from any other fiction film, and rightfully so. When following a "boy meets girl" story, the spectators are not interested in watching Technicolor wizard Harold Rosson designing the light for a complex dance number to be recorded from two camera positions at the same time – much less in the plethora of studio workers running errands. For the audience, Don and Kathy must be alone on that sound stage, bursting into a spontaneous, unrehearsed yet perfectly executed song-and-dance number. Post-production facilities are another space behind the camera where a lot of work takes place in the shadows. The classic example is film editing. Most editors – especially in narrative cinema – are required to create the impression of a sustained, seamless continuity between different shots. Through strategies like cutting on action and eyeline matching, they strive for the so-called “invisible cut”, that is to say, an interruption that is not perceived as such by the viewers, but rather propels them into the following shot. The more skilled the editor, the more invisible his cuts, the more unnoticed his work. “Continuity” and “invisibility” are also the main aims of the form of image editing known as “color correction” or “color grading” : one of the many tasks of a colorist is to smooth light and color variations in different shots within the same scene, thus greatly contributing to make cuts less noticeable and sustain the spectators’ self-deception. So far, only the work of actors, directors and screenwriters has received wide public recognition. That is because, in an attempt to leave the "ghetto" of the early twentieth century’s nickelodeons and turn into a culturally-legitimate institution that would appeal to the upper class, film producers and distributors fostered the development of a “star system” and stressed the affinities between cinema and traditional, auteur-centered art forms like drama and literature. Although not being interested in becoming celebrities, cinematographer Peter Zeitlinger and colorist Dirk Meier (two experts featured in Berlinale Talents program this year) are happy whenever they get the chance to discuss film shooting and post-production. Their “insider” point of view on what happens in the space behind the camera contrasts with the widely-held, romantic myth that a movie is the solitary creation of a god-like director. For instance, for the past 20 years, the legendary filmmaker Werner Herzog has been delegating 90% of the decisions regarding framing and camera movement to Zeitlinger, whom he assigns to capture what goes on in front of the camera into a shot that contains the substance, the general mood of the story : “My work has a lot to do with poetry. You see, in German the word ’poetry’ [dichtung] comes from the verb ’dichten’, which means ’to compress’...” explains Zeitlinger. “Werner never discusses aesthetics and how a film should look, because these things are so boring for him. So, when we are shooting, he never tells me ’Do a close-up, do a long shot, frame this or that, move the camera here and there’. He gives me the freedom to navigate through the scenery and capture what I think is important”. 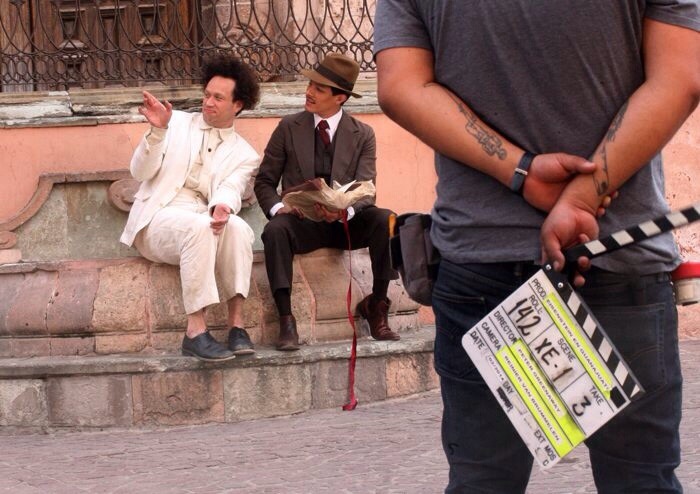 The very same filmmaking process based on mutual trust and top-down delegation is alluded to in Peter Greenaway’s visually-stunning, half-serious biopic Eisenstein in Guanajuato (2015). Watching silent film footage of his Mexican bodyguard while wearing a toga made out of a bed sheet, Eisenstein (Elmer Bäck) tells cinematographer Eduard Tisse (Jakob Öhrman) and factotum Grigori Aleksandrov (Rasmus Slätis) to continue the shooting of Que Viva Mexico without him : “We have been working together for many years, you know exactly what I need for the film” the Russian director basically says. A propos of working with eccentric, supposedly megalomaniacal mad geniuses, Meier was a colorist for Lars von Trier’s Antichrist (2009). According to Meier, from the very beginning, the director, the cinematographer, the production designer and the visual effects supervisor had very clear ideas about the movie’s “visual signature” : they wanted to “bracket” the whole story by using black and white sequences in super slow motion, and to present the space of Eden through heavily-processed “visualization shots” in which the Charlotte Gainsbourg character imagines herself walking in the woods. The latter shots were the most interesting and challenging for Meier to “deliver”, since they pushed the boundaries of what image-processing technology could do in 2009 : “The visual idea was to introduce noise in the image in order to make it disturbing to watch. After all, the story deals with what happens in the mind of a frightened woman. Stefan Ciupek and I achieved this unsettling feeling by adding several layers of color effects one on the top of the other, without worrying to undo a layer when we made a mistake. So we ended up with something like 30 layers and the computer couldn’t take it anymore, like the Charlotte Gainsbourg character”. What can be learned from these behind-the-scenes glimpses is that filmmaking is a collective labor that requires a good dose of creativity as well as a profound technical knowledge (as one of the few experts in huge digital data streams in early 2000s, it was Meier who actually pressed the “Record” button during the shooting of the 90-minute steadycam shot in Alexander Sokurov’s Russian Ark, on December 23rd 2001). The director is the vertex of the pyramid – his task is to provide ideas that the actors and each department will contribute to transform into something concrete, made of moving images and sounds. Just like the space in front of the camera lenses, the space behind the camera is a workplace. Yet, the space behind the camera is not simply a backstage devoted to the mere recording of the profilmic : “Hardly anything in cinema is ’life as it is’” states Meier, who, coincidentally, has just finished color grading Anton Corbijn’s Life (2015), a biopic of the photographer who helped create James Dean’s legend by staging the 1955 iconic “James Dean Haunted Times Square” picture. Therefore, it would be interesting to think of the camera lenses as a stargate allowing the forces from the reality in front of the camera and the creative energy from the backstage to come into contact, producing a big bang that creates the film world we will see on screen. Images : Eisenstein in Guanajuato (Peter Greenaway, 2015) / Antichrist (Lars von Trier, 2009) / Shooting of Eisenstein in Guanajuato.